Shorter days, blowing leaves, and cooler temperatures are reminders that winter is coming. If you’re like me, you’re scrambling to get your “To Do” list completed. Raking leaves, painting house trim, and cleaning out flower beds are just a few of the tasks I have remaining. It’s also the time to change your furnace filter. Do you change your furnace filter according to the recommended interval? Do you buy the cheapest filter you can? Do you know what a furnace filter is and how it works? 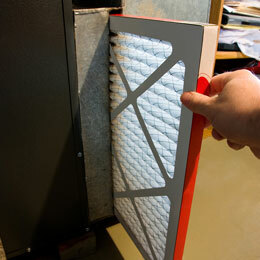 The purpose of a furnace filter is to keep contaminants out of your blower fan. Contaminants include hair, pet dander, dust, allergens, and other things that are sucked into your air return ducts. Here is some information on selecting and installing the right replacement furnace filter for your home and family. 1. Many different shapes and sizes. When you arrive at the section in the store where furnace filters are sold, you’ll be out of luck if you don’t know the appropriate size. Especially in bigger stores, filter size and selection can be overwhelming, preventing you from taking a guess. The size of a furnace filter is based on width, length, and thickness. For example, the size of my furnace filter is 16”x20”x1”. If you recently purchased a new home or had a new furnace installed, check your owner’s manual to determine the correct size. A filter that’s the wrong size won’t fit or stay in place after installation. After you figure out the correct size, consider writing the number on your furnace filter cover so you can see the size at a glance. Flat disposable filters. These filters are very cheap and are made of fiberglass. Their job is to protect your HVAC system from large dust particles. Pleated filters. These filters are made of polyester or cotton paper sheets, which traps more particles/contaminants. High Efficiency Particulate Air (HEPA filters). These filters are the best at removing the most particles from the air flowing through your HVAC system. However, due to their thickness, it may cause your system to work harder. Before buying this type of filter, check with your owner’s manual to see if this type of filter can be used. If you suffer from severe allergies, you may want to have a separate air filtration system installed in your home. Lastly, make sure you check out the Minimum Efficiency Reporting Value (MERV). The scale ranges from 1 to 16. The higher the number, the greater the percentage of contaminants that are captured with each pass. 3. Installation. After you have selected the appropriate filter for your home, it’s time to install it. Make sure your thermostat is turned off so the furnace is not running. Also, consider shutting off the power. My furnace has a switch that I can turn off while doing the installation. If yours doesn’t have a switch, consider turning off the power at your circuit breaker. 4. Point the arrow in the right direction. You’ll find an arrow on the filter frame. Always place the arrow facing towards the furnace. To learn more, check out Home Depot’s “Air Filters Buying Guide”. Do you have any tips you’d like to share? I’d love to hear your thoughts; please share them in the box below.